The summer is the perfect time to host a fun backyard barbecue and invite all of your friends over for a delicious warm weather meal on the patio. So when the forecast predicted an unseasonably cool Monday, we knew exactly what we wanted to do. Knowing that Adam is quite the expert griller, I wanted to look for a recipe that would perfectly compliment his skills, be healthy, and just taste like the essence of summer. So you can imagine the perfect fit when I came across this mouth-watering flank steak recipe from Food & Wine magazine. It took us a whopping 5 minutes to throw this easy marinade together the night before, and we let the steak marinade for 24 hours. As you can imagine hosting a group of 10 people for dinner, we were super relived to come home from a long day of work and simply throw the steak on the grill for a good sear for 10 minutes. It was perfectly cooked, juicy and lightly pink when we carved it up for our guests. There were so many good moans and groans while taking first bites that many of our guests begged for the recipe. Oh my goodness, this one is a keeper and definitely a must try for lean red meat lovers everywhere! 1) In a large bowl, combine the minced garlic, rosemary, oregano, mustard and vinegar and beat until well combine. Gradually add olive oil wine whisking until creamy. You can also use blender to combine all ingredients. Season mixture lightly with salt and pepper. 2) Place steak in a glass baking dish (9x13 works well), and sprinkle sea salt and pepper and rub into the top of the meat. Pour marinade over meat (you can reserve 1/4 cup of the mixture to drizzle over steak after cooked); turn the meat to coat well. Cover the dish with plastic wrap and refrigerate for at least 4 hours and up to 24 hours ( we recommend overnight for most flavorful results). 3) When ready to grill the steak, oil the grates of your grill well, and heat to moderate heat. Remove the steak from the marinade, letting the excess mixture drip off and season well with sea salt and pepper. 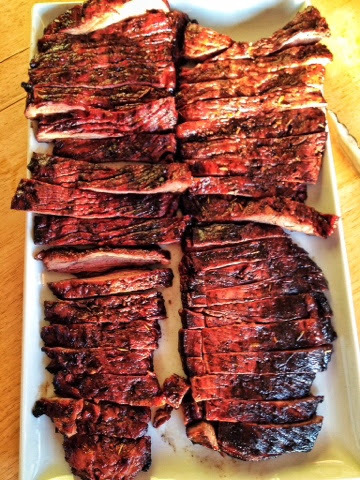 Place the steak on the grill (turning occasionally) and sear on both sides lightly until internal meat temperature reaches 125 degrees (10 - 12 minutes). 4) Remove steak from the grill, and let rest on a carving board for 5 minutes. Once it is cooled slightly, carve 1/2 - 3/4 inch pieces of steak against the grain, and serve. Drizzle the reserved vinaigrette over each serving for maximum flavor. 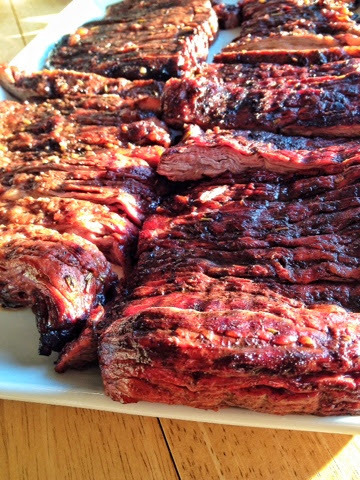 I hope you will try this recipe the next time you're craving a juicy, lean piece of steak. You can't go wrong, my friends. This one is fail proof! My mouth is watering...this looks delicious! My husband loves to grill too, I may give him this recipe for us to try! This looks delish! I love balsamic on steak, so this is right up my alley. Thanks for sharing!